Parking and Transportation Services (PATS) would like to inform the UNM community that main campus will experience heavy traffic on and around the UNM campus from Nov. 30 – Dec. 2, 2018. Please be advised that on Saturday, Dec. 1 from 3 p.m. and until the conclusion of the Twinkle Light Parade, Girard Blvd. will be closed between Central Ave. and Campus Blvd. 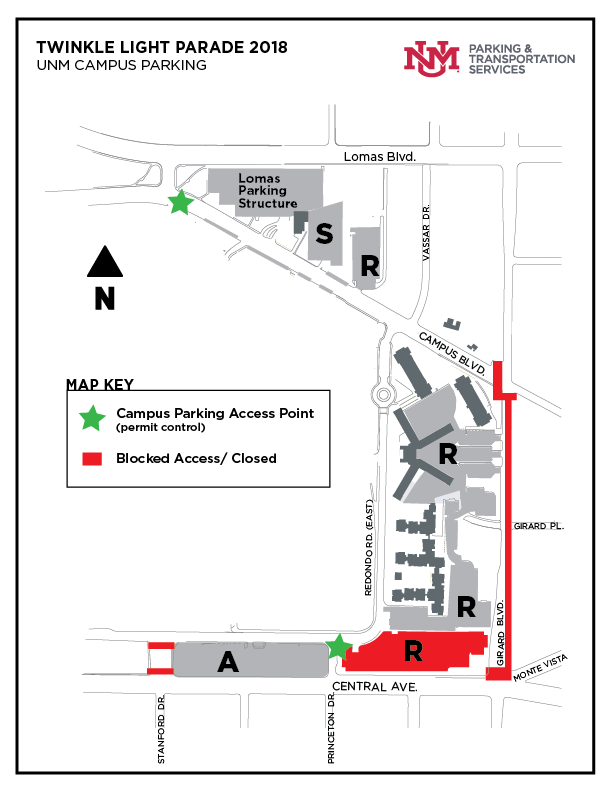 Public access to campus parking will be closed, however R and S (Lomas Parking Structure) permit holders will be allowed to access their respective lots by way of Campus-to-Redondo or Princeton-to-Redondo Dr. See map. UNM parking permit holders will need to show their parking permit to Enforcement Officers in order to access certain parking lots. Do NOT Move the Barricades! Saturday’s event will require the closure of parking spaces/areas in and around the R zone and specifically spaces located in the R-Central/Girard lot. During this partial closure, and only on Saturday, Dec. 1, R permits will be allowed to overflow into the J lot. Due to expected heavy traffic and construction activities on campus allow for extra travel time and plan accordingly. For more information, please contact our office at 277-1938.